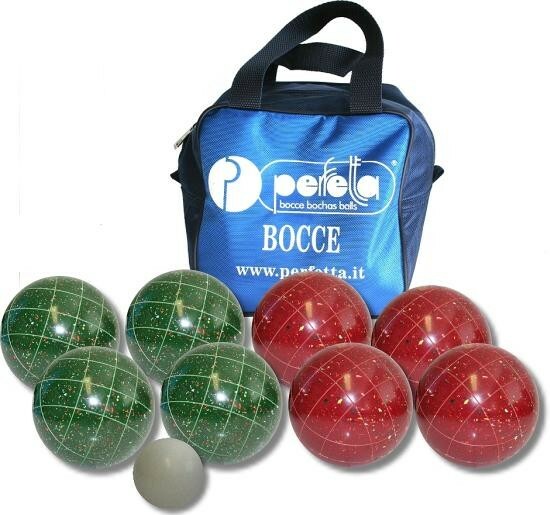 Original Tournament Boccia Set by Perfetta - world leader in boccia Made in Italy. Set of 4 green and 4 red synthetic boccia balls, including 50mm target ball, instructions and practical nylon bag. Available in two diameters (100, 107 mm). Boccia is togetherness, exercise, play and lots of fun. It can be played by young and old and strengthens the coordination ability and sense of balance. The original set of boccia balls by Perfetta guarantees lots of fun on the beach or in the garden. Thanks to the nylon bag, the set is comfortable to carry anywhere. Including Pallino (target ball).